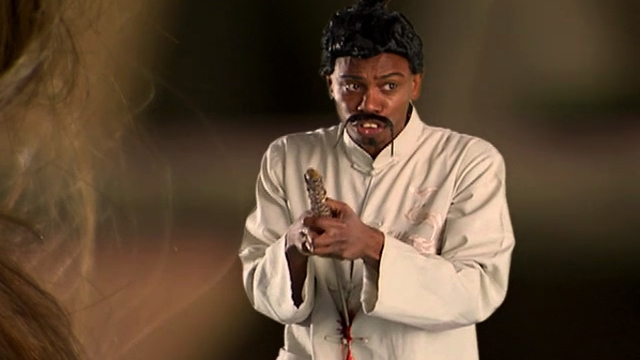 Season 3 of Chappelle’s Show was always going to have a lot of controversy involved in it, as well as a lot of interest, not only from the public but people in the industry as well. The success of the first two seasons, which made Dave Chappelle a huge star and along with it earned him a huge pay check for more seasons, also caused him a lot of anxiety and got him thinking of the reasons why he was famous and why the public loved him so much. He thought the audience was intelligent enough to understand his humour for what it was – something to snap people out of the incessant need for racial and religious bigotry and instead realise we are all one and the same with the only differences being cultural. But his fear, after seeing people’s reaction to him in the streets as well as in the media, was that maybe his jokes were just enforcing the stereotypes and doing more damage than good. He walked out during the filming of the third season and the ‘lost episodes’ went to air as a three episode, third season. Though only three episodes long and showing what must have been unfinished or at the very least ‘un-finessed’ work, the show was still as strong as ever. Also, to the show’s credit, after screening the ‘Racial Pixie’ sketch they then spent nearly 10 minutes of the showing interviewing the live audience asking their views on the skit and its impact. It actually made for good TV, but at the end of the day, Dave had said if they ever aired any of the work from that third season he would never come back to the show, and seeing as it’s six years later and there’s no sign of him, I’d say he’s being very true to his word. 9 out of 10 from me.